This is likely to make our list of cult favorites on Netflix in the future. The Babadook had a lukewarm reception when it first released in Australia, but it has since garnered critical acclaim and a strong following among horror buffs. The “found footage” genre is a favorite in horror movies, popularized by the likes of The Blair Witch Project. If that’s what you’re in the mood for, V/H/S/2 might be perfect for you. The film attempts something unique. It has seven different directors shooting seven short segments, all of which tie together to make one narrative. This includes some big names, like the director of The Raid, the writer of Grindhouse, and so on. Subsequently, V/H/S/2 struggles to build an atmosphere of terror. But it delivers jump scares in spades. While it’s not a typical “jump scare” movie, Wan uses the classic trick to good effect throughout the film. There are a dozen such moments, according to Where’s The Jump, but I’m pretty sure you’ll be frightened more often than that. It’s what makes this one of the best scary movies on Netflix. Josef is dying of a terminal illness and wants to record messages for his soon-to-be-born son. He puts out an ad on Craigslist to find a videographer. A guy named Aaron shows up. What follows is a slow unravelling of Josef’s life, that gets creepier and creepier, while Aaron continues to shoot. The jump-scare dial is turned up to 11 in this one. The plot of Friend Request is quite silly, but it’s the perfect sort of movie to watch with your friends for a jump-scare delight. It was never going to win any Oscars, but if you can’t have fun with something like this, you might want to go for one of the other best horror films for geeks where technology takes an evil twist. Jump scare movies are made for Halloween. 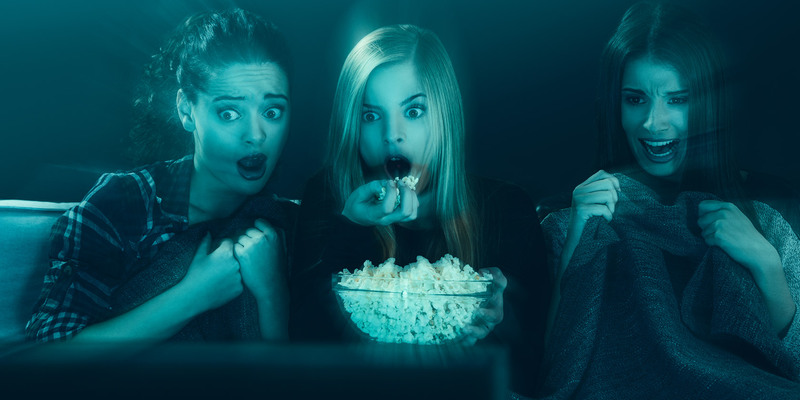 If you want a spooky night on All Hallow’s Eve, grab a tub of popcorn, switch off the lights, and start streaming one of these films on Netflix. However, a movie only gives you an hour or two of frights. Those who are ready to stay up all night need more than that. Which is where the scariest TV shows to binge-watch prove their worth.